1. When you should choose targeted bisulfite sequencing? The technology of targeted bisulfite sequencing combines bisulfite conversion with targeted amplification of regions of interest, and the next-generation sequencing. It is a rapid and efficient tool for analysis of up to 10 kb of targeted genomic regions in up to 96 samples at a time. The results offer absolute quantitation of cytosine methylation at single-base resolution. Furthermore, this method can be used to confirm the results obtained from whole genome bisulfite sequencing, reduced representation bisulfite sequencing, and methylated DNA immunoprecipitation sequencing. 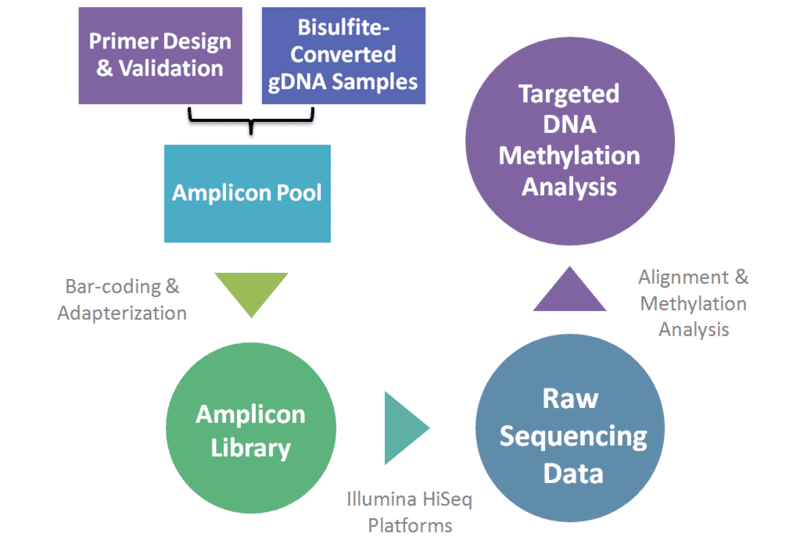 Targeted bisulfite sequencing allows for better determination of SNPs and methylation status events, and a better understanding of human disease. 2. What are the advantages of targeted bisulfite sequencing as compared to other technologies of methylation sequencing? Compared to whole genome methylation profiling studies, the methylation detection of only selected candidate regions is a more viable approach that makes methylation analysis more feasible and accessible in different settings. Targeted bisulfite sequencing dramatically increases data throughput and brings down the cost. Meanwhile, it is also able to detect the methylation status of regions that cannot be detected by RRBS (reduced representation bisulfite sequencing) or immunoprecipitation approaches. Targeted bisulfite sequencing has been widely applied to the methylation sequencing and validation of large sample cohort in target regions. 3. How to design proper probes or primers? A successful application of targeted bisulfite sequencing largely depends on the proper design of probes and primers. There are a lot of effective tools for generating probes or primers in an automatic fashion, such as ppDesigner (http://genome-tech.ucsd.edu/public/Gen2_BSPP/ppDesigner/ppDesigner.php) and PRIMEGENSw3 (http://primegens.org). After obtaining many probes candidates or primers candidates, the validation process is important for selecting the most optimal ones. 4. What is the workflow of targeted bisulfite sequencing? The workflow of PCR-based targeted bisulfite sequencing is depicted in Figure 1. As for hybridization-based targeted bisulfite sequencing, it can be performed either by bisulfite conversion of hybrid-selected native DNA or by hybrid selection of converted DNA. And the latter approach is now commercially available, which is characterized by superior target specificity, lower DNA-input requirements, and the ability to distinguish a C to U bisulfite conversion from a C to T SNP. Figure 1. The workflow of PCR-based targeted bisulfite sequencing. 1. Ziller M J, Stamenova E K, Gu H, et al. Targeted bisulfite sequencing of the dynamic DNA methylome. Epigenetics & Chromatin, 2016, 9(1): 55. 2. Lee E J, Pei L, Srivastava G, et al. Targeted bisulfite sequencing by solution hybrid selection and massively parallel sequencing. Nucleic acids research, 2011, 39(19): e127-e127. 3. Masser D R, Stanford D R, Freeman W M. Targeted DNA methylation analysis by next-generation sequencing. Journal of visualized experiments: JoVE, 2015 (96).